Child resistant closures are not "child proof" They are designed to increase the time it takes for a younger child to access the medication or chemical. They are "packaging that is designed or constructed to be significantly difficult for most children under five years of age to open or obtain a toxic amount of the substance within a reasonable time. It is not child proof packaging." Child resistant closures include both re-closeable and non re-closeable packaging. 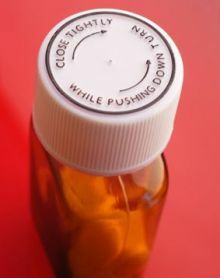 Re-closeable packaging involves a container fitted with a re-closeable top, or a child safety cap such as the "Palm-n-Turn" or "Clic-Loc" variety (such as methylated spirits or dishwasher powders). In New Zealand, child safety caps are required to meet the current New Zealand Standard (NZS 5825:1991). The majority of caps are mainly of the "palm-n-turn" variety. Recently on the market, there are the "3rd generation caps" available which allow an increased level of protection whilst providing easier access for adults. Products with child resistant closures still need to be stored in a secure location. The following list is based on the 1998 Code of Practice for Child Resistant Packaging and Toxic Substance, produced by the Ministry of Health.